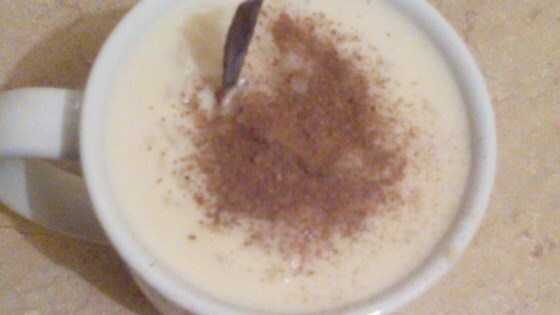 "Rice pudding (arroz con leche) made the traditional Mexican way, with both whole and evaporated milk and an aromatic touch of cinnamon." Combine water and cinnamon stick in a saucepan over high heat. Bring to a boil and cook until cinnamon releases its color and flavor, about 5 minutes. Add rice, reduce heat to low, cover, and cook until rice is tender and water is absorbed, about 20 minutes. Gradually add whole milk to rice, then evaporated milk. Stir in sugar. Cook uncovered until sugar is dissolved and mixture has thickened, about 10 minutes. Serve warm or cold. Sprinkle each portion with ground cinnamon. Easy recipe to go off of. Changed out the sugar for condensed milk. Had a little help form my Hispanic mother in law but other than that did it very easily on my own. I liked it! Easy recipe to go off of. I eliminated the sugar and replaced one cup of evaporated milk with one cup of condensed milk. Yummy!